Hey you guys! I feel like I haven't posted in for-ev-er! It's been just over a week since I've posted and although I made this card quite some time ago I haven't gotten my act together to write this post. 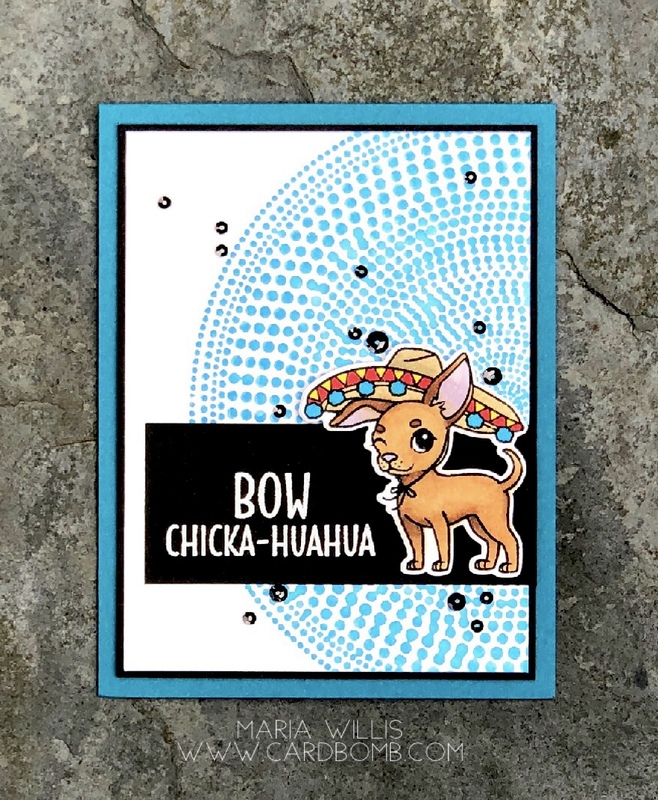 I am still loving this Chihuahua set from Hero Arts. The sentiments absolutely kill me! Bow Chicka-huahua! And, get a load of this guys eye wink-it cracks me up every time I look at it! For this card I started out with a Hero Arts background stamp called Sunburst Bold Prints (CG732). I inked it up with some Distress Oxide ink. Before stamping it onto my paper I gave it a quick spritz of water to activate the ink. 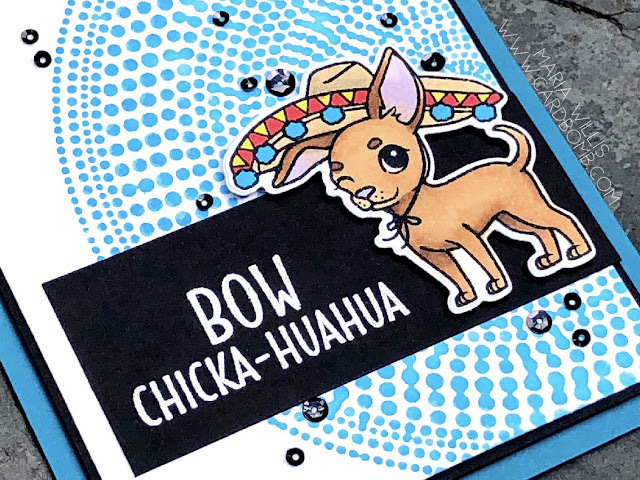 The charming little chihuahua is from Hero Art's It's Fiesta Time (CG252) stamp set. I stamped him with black Memento ink and colored him with Copic Markers. I cut him out with the coordinating dies (DI494) and used foam adhesive to pop him up over the sentiment piece. 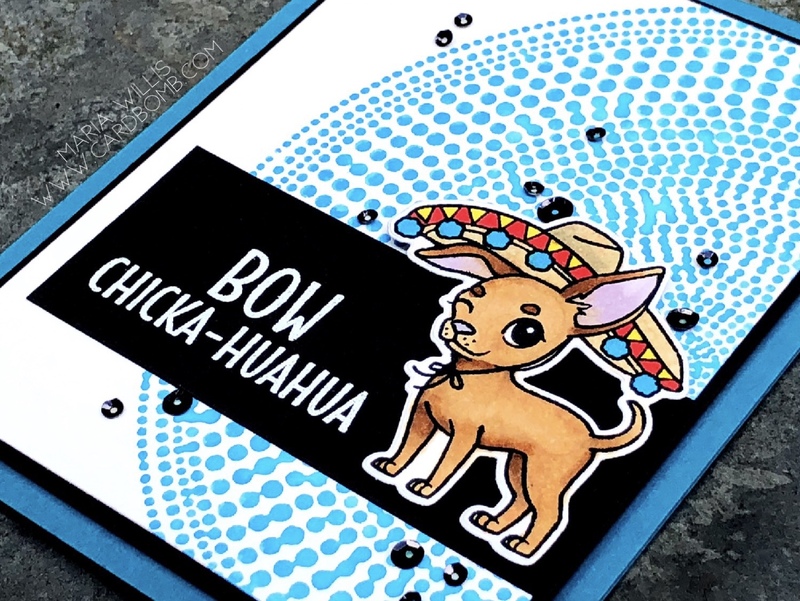 I finished the card off by adding a black mat and putting that on a card base of Island Indigo cardstock. The final touch was adding some black sequins in multiple sizes. I'm entering this card into this week's Simon Says Stamp Wednesday challenge (Click HERE to check out the challenge blog). This week's challenge is to use more than one stamp set and I've used two on this card. I'll be back soon! I've been playing around with Nuvo Shimmer Powder and that stuff is so amazing! I can't wait to share what I've made with you. Have an awesome day and I'll see you back here soon! Thanks Donna! It’s such a great set! Such a fabulous card, Maria! Love how you stamped background patterns and the colors you chose. 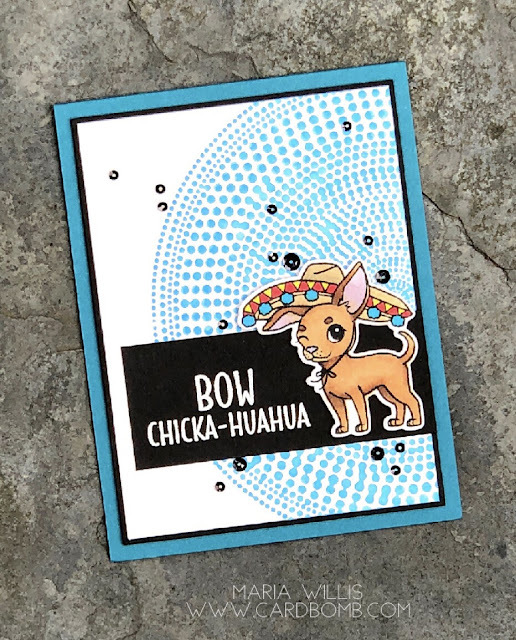 The Chihuahua was colored so nicely. Thank you for joining us at Simon Says Stamp Wednesday Challenge. Thank you so much Marge! wow !!! beautiful card :) i really like your good idea so much.Thank for sharing. Exciting Changes and a Mermaid Card!